On March 18, over 1,200 Latinos advocated for their community in Olympia as part of Latino Legislative Day. El Centro de la Raza organized 56 youth and individuals to speak to legislators in person about the community’s needs. We asked for support of our capital projects, including purchasing a building in Federal Way to expand programs and services to South King County, as well as on House Bill 1873 that intends to tax electronic cigarettes, electronic devices, and vape pens in the same way tobacco products are taxed. The experience was inspiring and motivating. 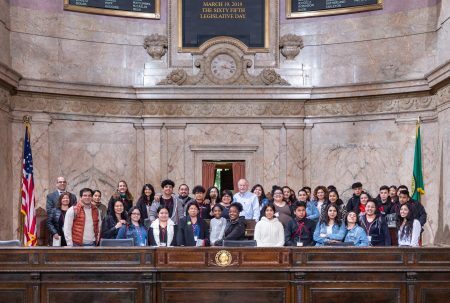 A Chief Sealth High School senior expressed the desire to become a Senator one day, standing on the steps of the State Capitol after listening to Senator Rebecca Saldaña encourage students to achieve their dreams. This entry was posted in Newsletter on April 2, 2019 by June Liu. 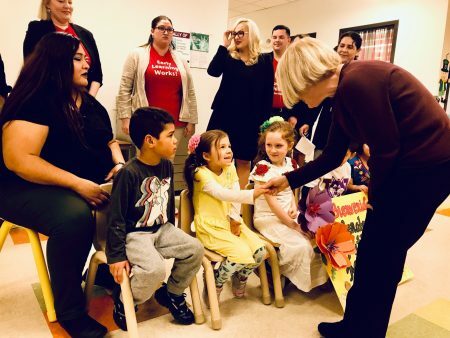 Senator Patty Murray came to El Centro de la Raza on March 18 to advocate for working families the access to high quality, affordable child care. She explained the comprehensive bill and how her co-sponsors are making child care a budgetary priority. This bill would cap expenses for eligible families, pay child care providers a respectable wage, and expand child care access to all families. Parents could return to the workforce without exhausting their family’s financial resources. It is also predicted that young children would benefit tremendously from quality care because they spend more time in the classroom developing their brains. The teachers at José Martí Child Development Center are explaining what social justice to young children is. While this is a complex subject to navigate for people of all ages, our teachers have prepared diligently to engage in these critical discussions. Some of the strategies they used included talking about differences, deciphering what is fair and not fair, using children’s literature and songs, teaching anti-bias lessons, providing familiar and relatable real-life examples, and encouraging critical thinking to explore solutions. Four-year-old Issac responded positively to these activities. He drew a picture of himself holding a sign that said, “Boo Trump, no killing people.” When the teacher asked Issac to share his picture, he said, “I drew this because Trump has soldiers that kill people and he makes bad choices. I know because I hear on the radio and I saw it. I know that.” Our teachers hope these discussions can lead to tolerance and creating a better society. Martha Diaz said, “If I can make a difference in one child, maybe that child can make a difference in our world.” Please support our teachers so that they can continue doing this important work. This entry was posted in Newsletter on March 7, 2019 by June Liu. We must support immigrants’ role in workplaces. The Keep Washington Working Act (KWW) would protect our communities, economy, and resources by getting local governments out of the business of federal immigration enforcement. Click to learn why we need your help to pass the KWW bill this session, and notify your representative that you stand with the immigrants community. This bill is scheduled for a public hearing on Wednesday, February 27, at 1:30 PM. If you are unavailable to attend in person, you can still email your representatives by first clicking here to find which district you live in. After entering your address, your district number and legislators’ names will then appear. Some of your representatives may sit on the Senate Ways & Means Committee. Contacting them first is the highest priority. Click here to see the list of members for you to contact. This entry was posted in Newsletter on February 25, 2019 by June Liu. 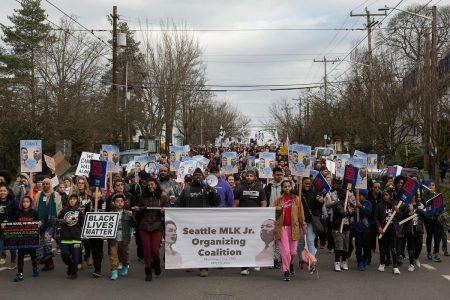 In November, community leaders held a press conference at El Centro de la Raza to reject the City’s contract with Seattle Police Officer’s Guild, the City’s largest police union. Community groups still believe the City needs to keep its promise of upholding the accountability system made possible by the 2017 Accountability Ordinance. The contract’s detrimental impact could weaken public trust and the progress the City has made under the Consent Decree. Last week, the Community Police Commission filed a brief to the Federal Court about the City’s contract with the SPOG. One of the CPC’s goals has been to ensure Seattle has a strong police accountability system that meets community standards. It is the only way to make sure the hard work done under the Consent Decree over the past seven years will be protected after court oversight goes away. The new police contract undermines that effort. Click to read CPC’s blog post. The Plaza Roberto Maestas After School Program serves 11 to 13-year-old scholars during a critical segment of their education: the middle school years. Our program supports youth academically through one-on-one mentoring and exposes them to a cultural enrichment curriculum affirming the contributions of people of color in American society. We plant the seeds of cultural advocacy and instill a passion for social justice. We are excited to partner with the Woodland Zoo starting this March. In an effort to create a prosperous Zoology Career Pipeline, this collaboration provides youth the opportunity to ask a zoologist questions in an intimate setting and even receive a special visit from a critter. Also, our two programs will be hosting Up Close Encounters on-site at El Centro de la Raza and visiting the Zoo every other month to learn about the Zoo’s operations. We are currently enrolling for the spring semester and accepting names for our summer waitlist. To learn more about the eligibility requirements, please contact Liz via email at lhuizar@elcentrodelaraza.org. This entry was posted in Newsletter on February 20, 2019 by June Liu. L.F. was in case management from September 2015 until August 2017. During this time, she participated fully in our services. L.K. emigrated from Ethiopia when she was seven years old after spending two years in a refugee camp with her family. She was able to learn the English language, survived domestic abuse from family members, sexism, and adultism, as well as bullying from students, teachers, and administrators. We started case management during her 8th grade year in school. She was referred because of her defiant behavior resulting in suspensions and discipline referrals, was very outspoken on social justice issues, and associated with friends who were prone to violence. The problems at school stemmed from the DV going on at home. To find outlets, L.F. participated in Aggression Replacement Training, and Powerful Voices Activistas Program, worked at the Woodland Park Zoo’s Summer Program, and improved her grades by attending after-school tutoring. L.K. continued her social justice work by leading the 2019 MLK Rally & March. She will graduate from high school in June and continue her education at a local college. This entry was posted in Newsletter on February 19, 2019 by June Liu. The Washington State legislature is considering House Bill 1847, an Act relating to aircraft noise abatement for impacted neighborhoods surrounding the Sea-Tac Airport. The Beacon Hill neighborhood is a “vertical fenceline” community located right underneath the fixed flight path where 70% of the flight arrivals fly over us about every 60 to 90 seconds. Flight operations from the Port of Seattle adversely impact the Beacon Hill neighborhood of 35,000 residents, yet the bill’s current language excludes us from the “impacted area.” As a direct result of planes flying overhead and major roadways surrounding us, these unjust environmental and health conditions expose residents – both young and old as well as new to long-time – to air and noise pollution. This entry was posted in Newsletter on February 14, 2019 by June Liu. Create a task force to recommend how environmental justice principles should be applied through agencies’ decision-making processes. You can contact your representatives by clicking here to find which district you live in. Your district number and legislators’ names will then appear. Feel free to use this sample call script and email template to guide you through the process. Some of your representatives may sit on the Senate Ways & Means Committee. Contacting them first is the highest priority. Click here to see the list of members for you to contact. Investigate the Washington Environmental Health Disparities map, companion report, and policy application analysis. Gain an understanding of lived experiences from communities of color that feel like they are bearing an “Unfair Share” of the environmental health burden. Take your support to Twitter and Facebook by saying why you support this bill using hashtags #HealWA and #WALeg. Feel free to use this profile picture frame to show your support. This entry was posted in Newsletter on February 12, 2019 by June Liu. We have the vision that all children will grow and develop to reach their full potential. Growing & Learning Together is a family support home-visiting program for pregnant women or mothers of a child under 3 years old. Visits are bi-weekly for approximately one hour. We provide research-based information to support parent-child interactions, provide strength-based parenting support, and serve as partners in the well-being of the entire family. Our program also includes monthly group connections to connect with other families in the program, and we offer assistance with diapers, clothes, and books. We have space to enroll seven Seattle-based families right now, with more slots opening later this year. Click to read in Spanish and view the flyer in English. This entry was posted in Newsletter on January 30, 2019 by June Liu. Someday the Yanqui shall be defeated and if I am not around to see it the ants in the ground will come and tell me about it in my grave.